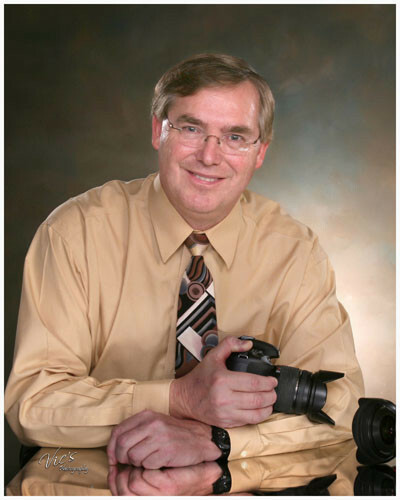 Vic’s Photography and Video Started in 1993 when Vic took over the video production side of his Fathers photography business. Vic started video recording weddings in 1983 and his business grew with the addition of commercial video and adding Photography to the existing business in 2004. Today he offers’ Photography and Video coverage of Wedding and Events. Portraiture of Family’s, High School Senior’s, & Business. As a licensed commercial Pilot, Vic also offers Aerial Photography. Video Production services include Corporate /Commercial Productions, and Digital Video transfers of Old home movies and Video tape to DVD. Growing up around photography, Vic learned to process film and develop Black and White prints at a young age, his interest to get involved in the family business took place when his father added Video Production of Wedding’s to his existing business. Working together they were considered the Pioneers in Wedding video in the country. Both Rich and Vic Rader were featured speakers at numerous conventions and seminars. He earned the Degrees of Master of Electronic Imaging and Craftsman of Photography from the Professional Photographers of America Association. With an Interest in Flying, Vic began flying lessons as a hobby, but continued to obtaining an instrument rating and Commercial Pilot Certificate. Brining both photography and flying together aerial photography became an addition to his business. Vic believes in having fun with his photography and video production, he is passionate about his images showing this, along with the excitement created in the images for his client. At the same time no lack of attention to the details in the photographs he creates. Expressions, Clothing, Backgrounds, just to mention a few are always closely considered in his Photography. Images and Productions created by Vic are timeless and will be cherished for a lifetime. Vic’s Photography and Video located in Fremont Nebraska, also serves the Omaha, Lincoln and Surrounding Area. He can be contacted by phone at 402.721.9121, or visiting his office at 340 East 9th, Fremont, Nebraska. Evening appointments available.